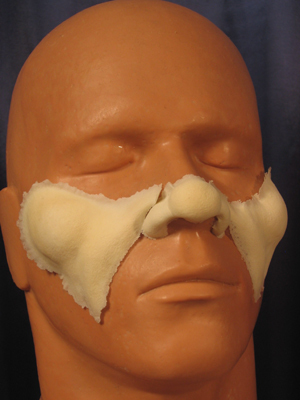 Turn yourself into Santa with our foam latex Santa nose and cheeks set. Carefully remove these pieces and store them powdered, sealed and out of light. They should last for several applications. Tip #1: Remove the Santa nose and cheeks using 91% or 99% rubbing alcohol. Let the alcohol do the work and remove the appliances after they’ve loosened. Once you’ve removed them, let them dry completely. Then powder with translucent powder and store them in a plastic bag. Put a little powder in the bag to ensure the appliances don’t stick to the bag. If the edges stick to the bag or fold on themselves, use a little more rubbing alcohol to free them, then re-powder. Tip #2: Mix a LITTLE red RMG makeup with white RMG to make a rosy color. Thin the makeup with 91-99% alcohol. Use a makeup sponge to apply. Be sure to apply the makeup sparingly. A little goes a long way.